Simon & Schuster, 9780743203173, 432pp. The U.S. government pitted two companies—the Union Pacific and the Central Pacific Railroads—against each other in a race for funding, encouraging speed over caution. Locomotives, rails, and spikes were shipped from the East through Panama or around South America to the West or lugged across the country to the Plains. In Ambrose's hands, this enterprise, with its huge expenditure of brainpower, muscle, and sweat, comes vibrantly to life. Richly readable...[Stephen Ambrose] bears the reader on shoulders of wonder and excitement. This magnificent tale of high finance, low finagling, and workers hacking through 2,000 miles is magnificently told. 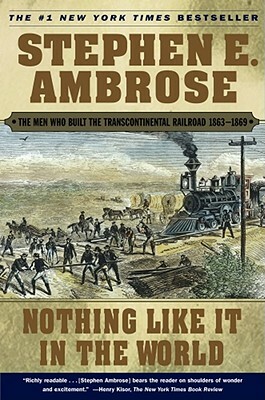 Climb aboard...this lively tale, a colorful, edifying story of U.S. history....Ambrose is the bard of American accomplishment. Stephen Ambrose has done it again....Ambrose should be read as much for his muscular prose and talent to get at the heart of the matter as for his research.